Dr Soares Magalhães is Associate Professor of Population Health and Biosecurity and Program Director, of the Master of Veterinary Science. 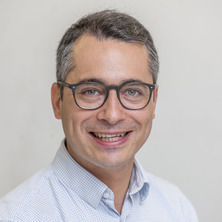 Dr Soares Magalhaes is Head, UQ Spatial Epidemiology Laboratory and a European Specialist in Population Medicine with extensive research experience in three main areas: spatial epidemiology of zoonotic infections, outbreak response for emerging infectious diseases and animal’s environmental health/biosecurity. A key focus of his current research is to understand the geographical risk and environmental drivers of major zoonotic diseases of humans in order to improve surveillance and risk management, with consequent reductions in their burden in human and animal populations (“geo-One Health”). Using a combination of geospatial methods, population-based surveys and intervention studies designed at UQ, Dr Soares Magalhães’s team has shown the potential of enhanced biosecurity to reduce the risk of propagated outbreaks of avian influenza, rabies and Q fever. His team has recently shown that environmental variation in climate and landscape are major drivers of childhood zoonotic infections and associated morbidity including schistosomiasis, soil-transmitted helminth infections, anaemia and cognitive development. - Understand geographic co-variation in infection risk in humans and animals. - Determine the role of climate / landscape variation and health behaviour on geographical variation in the efficacy of control strategies. - Mechanistic studies on helminth-associated childhood morbidity. - Geographical management plans for emergency animal diseases. - Determine role of animal movement on outbreak size and geographical propagation of zoonotic infections. - Design of on-farm / abattoir environmental risk assessment management plans for animal health. Gyawali, P., Khanal, S. and Soares Magalhaes, R. J. (2013) Helminth infections in an Indigenous community of Nepal: the role of individual and household socio-economic factors. Global Journal of Medical Research: Diseases, 13 3: 33-39. Distribution of complementary and alternative medicine (CAM) providers in rural New South Wales, Australia: A step towards explaining high CAM use in rural health? Pfeiffer, Dirk U., Brown, Ian, Fouchier, Robert A. M, Gaidet, Nicolas, Guberti, Vittorio, Harder, Timm, Langston, Rowena, Soares Magalhaes, Ricardo Jorge and et al. (2006) Opinion of the Scientific Panel Animal Health and Welfare (AHAW) related with the Migratory Birds and their Possible Role in the Spread of Highly Pathogenic Avian Influenza. EFSA Journal, 4 5: 1-46. Pfeiffer, D., Lloyd, D., Loeffler, A., Soares-Magalhaes, R., Rich, M., Roberts, L. and Lindsay, J. (2005) Identifying risk factors associated with MRSA infection in companion animals. Journal of Small Animal Practice, 46 10: 490-490. Zaw Win, T. T., Campbell, A., Magalhaes, R. J. S., Oo, K. N. and Henning, J. (2017). Multispecies livestock rearing in developing countries – a challenge to collect, present and interpret surveillance data. In: Proceedings of the 3rd International Animal Health Surveillance Conference: Beyond animal health surveillance. 3rd International Animal Health Surveillance Conference, Rotorua, New Zealand, (109-112). 30 April - 4 May 2017. Win, Tu Tu Zaw, Campbell, Angus, Magalhaes, Ricardo Soares, Oo, Kyaw Naing and Henning, Joerg (2016). Perceptions of small-scale livestock farmers on the risk of acquiring zoonotic diseases from their livestock: a cross - sectional study in Myanmar. In: Congress Abstracts. One Health Ecohealth 2016: 4th International One Health Congress and 6th Biennial Congress of the International Association for Ecology and Health, Melbourne, Australia, (510-510). 3-7 December 2016. Henning, Joerg, Tizzani, Paolo, Potzsch, Carsten, Šašić, Srdjan, Viviani, Paolo, Pejovic, Nikolai, Soares Magalhaes, Ricardo J. and Hrapović, Mevlida (2015). Factors influencing the success of an aerial vaccination program of foxes against rabies in Montenegro. In: ISVEE14: Proceedings of the 14th International Symposium on Veterinary Epidemiology and Economics. International Society for Veterinary Epidemiology and Economics, Merida, Mexico, (). 3-7 November 2015. Gray, D. J., Williams, G., Bieri, F., Li, Y., Du, Z. -W., Yang, H., Olveda, R., Tallo, V., Clements, A., Steinmann, P., Halton, K., Bedford, A., Yuan, L., He, Y., Yap, P., Alday, P., Mationg, M. L., Renossa, M., Stewart, D., Wang, D., Raso, G., Magalhaes, R. Soares and McManus, D. (2015). The 'Magic Glasses' research programme for the global control of intestinal worms. In: *, *, (5-5). *. Clements, Archie C., Magalhaes, Ricardo Soares, Brooker, Simon and Fenwick, Alan (2009). Spatial analysis and disease mapping : Tools for planning and evaluating integrated neglected tropical disease control in Sub-Saharan Africa. In: Abstract Book : American Society of Tropical Medicine and Hygoeme : 58th Annual Meeting. 58th Annual Meeting of the American Society of Tropical Medicine and Hygiene, Washington, DC, United States, (31-31). 18-22 November 2009. Magalhaes, R. S., Loeffler, A. and Lindsay, J. (2008). Links to the health care system as indirect risk factors for methicillin-resistant Staphylococcus aureus infection in dogs and cats. In: 13th International Symposium on Staphylococci and Staphylococcal Infections, Cairns, Australia, (). 7-10 September 2008. Soares-Magalhaes, R. J., Wieland, B., Otte, J. and Pfeiffer, D. (2008). Simulation modelling of Highly Pathogenic Avian Influenza (HPAI) H5N1 outbreaks in Vietnam. In: Does control of animal infectious risks offer a new international perspective ? : proceedings of the 12th International Conference of the Association of Institutions of Tropical Veterinary Medicine. 12th International Conference of the Association of Institutions of Tropical Veterinary Medicine, Montpellier, France, (). 20-22 August 2008. Loeffler, A., Soares-Magalhaes, R. and Lindsay, J. (2008). When do dogs and cats acquire Staphylococcus aureus infection? - Two case-control studies. In: International Symposium on Staphylococci and Staphylococcal Infections, Cairns, Australia, (). 7–10 September 2008. Soares-Magalhaes, R. J., Goutard, F., Demissie, A., Yigezu, L., Jobre, Y., Roger, F. and Pfeiffer, D. U. (2007). Quantitative assessment of the risk posed by live bird imports for the introduction of HPAI H5N1 into Ethiopia. In: Proceedings of the 12th International Conference of the Association of Institutions for tropical Veterinary Medicine. 12th International Conference of the Association of Institutions for tropical Veterinary Medicine, Montpellier, France, (). 20 - 23 August 2007. Soares-Magalhaes, R. J., Dale, J., Gover, K., Mawdsley, J., Mitchell, A., Smith, N. H. and Stoker, N. G. (2006). Investigating the cluster of Mycobacterium bovis Spoligotype 13 in the Southeast of England. In: D. J. Mellor, J. L. N. Wood and A. M. Russell, Society for Veterinary Epidemiology and Preventive Medicine : Proceedings. Annual Meeting of the Society of Veterinary Epidemiology and Preventive Medicine 2006, Inverness, Scotland, (). 30 March - 1 April, 2005. Soares Magalhaes, Ricardo (2011). Spatial Epidemiological Approaches for the Control of Infection and Morbidity Associated with Neglected Tropical Diseases in sub-Saharan Africa PhD Thesis, School of Population Health, The University of Queensland. Spatiotemporal impact of an eight-year mass drug administration programme on soil transmitted helminth infections and anaemia in Burundi.